Other than a 1995 box set The Finer Things, there haven’t been many compilations that features both Steve Winwood’s solo tracks and his works with the Spencer Davis Group, Traffic and Blind Faith. That oversight has been remedied with this new 17-track anthology. It chronicles a very legendary and extraordinary career starting with the Spencer Davis Group (the classic “Gimme Some Lovin’” and I’m a Man”), through the psychedelic rock of Traffic (“Dear Mr. Fantasy,” “The Low Spark of High-Heeled Boys”) to the memorable supergroup Blind Faith (“Can’t Find My Way Home”). After Traffic broke up, Winwood’s solo career started in the late ‘70s and slowly blossomed (“While You See a Chance,” “Valerie”) before he broke through in the mid-‘80s with a series of pop-soul hits (“Higher Love,” “Roll With It”). 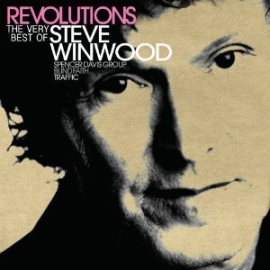 These days Winwood’s current works fuses both the soul music of his solo career and Traffic’s classic sound (the more recent “Dirty City”); for Revolutions, he recorded a new version of “Spanish Dancer,” which was originally from Arc of a Diver. Revolutions is serviceable set and does a nice job, though fans would probably prefer a more comprehensive set (A 4-CD set is also available and differs from the single CD on a few tracks).